Most of us are aware of (or may be part of) a family where siblings are radically different from each other, their personalities, interests, and value systems sometimes seeming to be completely opposite. It is difficult to chalk this up to either nature or nurture because both parties couldn’t have a more common nature environment, or common nurture environment. Having been raised in the same household for their entire lives, and being biologically from the same sets of DNA, what could possibly cause such stark differences? Psychologists and biologists have attempted to tease out the influential factors by studying criminal records, IQ, personality traits, and sexual preferences of identical twins raised together, identical twins raised apart, adoptive siblings raised together, fraternal twins, siblings, and random pairs of strangers. Criminality appears to have influences from both nature and nurture, while IQ seems largely hereditary. Some studies support the conclusion that personality traits are mostly hereditary, while others lean toward environment. Sexual preference appears to be unrelated to DNA, yet is also hard to explain by environment alone, given the results of identical twin studies. However, even in studies of these traits, where correlations are observed, the correlations tend to be small, leaving a large portion of the reason for such traits up in the air. 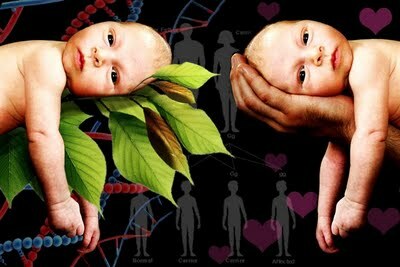 Mathematically, nature plus nurture doesn’t appear to explain why we are the way we are. However, if instead we adopted the well-supported and researched view that we are not our bodies, then our consciousness exists independent of our bodies. As such, it is reasonable to expect that that consciousness learns, adapts, and evolves across multiple lifetimes, and perhaps non-physical experiences. And this would certainly provide an excellent explanation for the anomalies listed above. It would make sense, for example, that IQ, perhaps being related to the function of the brain, be largely influenced by genetics. However, it would not make sense for value systems to be genetic, and the influence from family environment would only extend back to childhood; hence personality traits should show some nurture correlation from “this life”, with the majority of the influence being from past lives (and therefore, a mystery to those who don’t understand or accept this paradigm). Research supports this view and notes that ‘many aspects of the child’s present personality have carried forward intact from the past life: behavior, emotions, phobias, talents, knowledge, the quality of relationships, and even physical symptoms.’ Sadly, such research is as heretical to scientific orthodoxy as heliocentrism was 500 years ago, although referring to it as epigenetics may be a safe way for scientists to dip their toes into the water without getting scalded. So, the next time someone gets on your case for not living up to the family ideal, smile knowingly, and be proud of your karmic heritage.